NO-AD = NO SUNBURN! FAMILY-APPROVED SUNCARE FROM THE STATES COMING SOON! We’ve not long returned from a trip to Thailand, one of our favourite destinations. We always go away in the early part of the year to escape the cold and miserable weather and you’re pretty much guaranteed wall-to-wall sunshine in Asia. This year was no exception and we enjoyed 3 weeks of bright blue skies and sizzling temperatures that didn’t drop below 30 degrees Celsius for the entire trip. When everything’s been kept under wraps since the summer, it’s important to use a good quality sun protection that you can trust so, of course, we packed our Techniblock. We had planned a couple of boat trips as well as some kayaking in the Khao Sok National Park and the SPF 50+ and SPF 50 Wet & Dry is perfect for this type of activity. However, we also took the opportunity to test a brand new product from the States. We are always on the look out for great sun protection and there’s no doubt that Techniblock is one of the absolute best, but we like to give our loyal customers plenty of choice and have discovered an excellent American brand called NO-AD. It came highly recommended by one of our American friends and so we put it through it’s paces in the searing heat of the Thai sun. The verdict? It performed brilliantly. It’s very similar to Techniblock in that it’s a continuous spray that distributes sunscreen on to the body in a quick and efficient way. We found that it was best to spread it lightly with your hands to help it absorb quickly and once it settled on to the skin, it was clean and non-greasy. We didn't burn at all, despite the high temperatures. NO-AD is free from parabens, Retinyl Palmitate, oils and perfume, and the can holds 295ml so it’s a great size offering great value for money. NO-AD stands for "No Advertising”, with the manufacturer’s declaring that rather than spending money on expensive adverts, they invest in creating a great sun protection range at an affordable price. How is it different to Techniblock? Well, in our view, it is not quite as ultra-dry as Techniblock and so it’s best to lightly rub it in as you apply it, and it’s not quite as water resistant so the recommendation is to top up after about 80 minutes of swimming or sweating. Other than those two minor observations, we gave it a resounding thumbs up. NO-AD is available in a lotion and a spray and we intend to introduce the CFC-free spray option to the Techniblock website in the next few weeks. Due to range changes in South Africa, we have very limited stock of Techniblock's SPF 30 in the 340ml size and will be unable to get further supplies for the foreseeable future. Although we are still able to offer our customers Techniblock SPF 30 in 150ml and 75ml sizes, we are aware that the 340ml size is very popular so the NO-AD SPF 30 Sport is a great substitute if you’re looking for a larger can. If customer feedback is positive, and we think it will be, we will eventually expand the range to include NO-AD SPF 45 Continuous Spray and the SPF 50 Kids Continuous Spray, as well as a natural, clear mineral formula in lotion format for babies. It's coming soon so give it a try this summer, you won’t be disappointed. Avoiding being bitten by mosquitoes is essential; reducing the number of bites you receive reduces the chance of infection developing so it’s important to take practical measures to avoid mosquito bites if you’re visiting an area where malaria may be present. Mosquitoes that transmit malaria typically bite after sunset, although day biting mosquitoes transmit other diseases so bite avoidance should be practiced at all times. If sleeping in an unscreened room, or out of doors, a mosquito net impregnated with insecticide is a sensible precaution. Portable, lightweight nets are available to buy. Find out if malaria prevention tablets are advisable for the country you intend to visit. 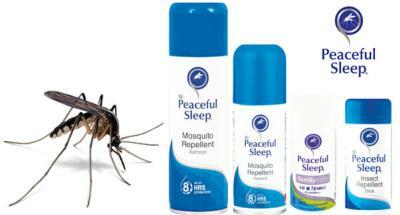 We recommend Peaceful Sleep Insect Repellent as a deterrent against bites from mosquitoes, midges, flies, fleas and ticks. Developed in South Africa, Peaceful Sleep is the number one choice for Safari Rangers and has proven to be reliable and effective at preventing painful, irritating and potentially deadly bites. It can be purchased in spray or stick format. The aerosol offers clean, clear, non-greasy and non-sticky spray protection that is breathable and very suitable for sensitive skin. One light application to the skin lasts for up to 8 hours. Clothing can also be sprayed, including the turn-up on trousers. The stick targets specific areas such as the face, ears, wrists and ankles and is also available in a non-DEET child friendly option for babies 6+ months and children up to 12 years of age. If your idea of Christmas cheer is relaxing by the sea, watching the sun set with a cold beer in hand, you may be one of the many people who has booked a trip to an exotic, far flung destination this winter. 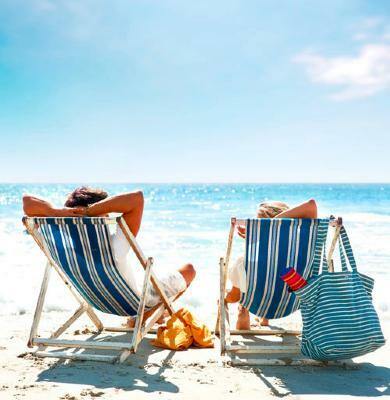 It may have been a fabulous summer but most of us have been keeping everything under wraps since October so if you’re heading for the beach, cruising the Caribbean or jetting off on safari, a good quality sun protection and an effective insect repellent are holiday essentials. With the majority of shops dedicating shelf space to Christmas and soon-to-be January sale goods, the choice of sunscreens are few and far between and often hard to find in the midst of all the tinsel and Christmas trees! Browse our dedicated online shop for a great choice of sunscreens in a variety of SPFs and sizes to suit every skin type. Techniblock SPF 30 is perfect for medium skin that tans easily, SPF 40 may be your SPF of choice if you are heading somewhere particularly hot and, if you are very fair skinned or a redhead, you can rely 100% on Techniblock’s SPF 50+ spray, which provides very high protection for those that burn easily. The entire range of Techniblock sun protection sprays are quick and easy to apply, very long lasting, and completely free from oils, emulsifiers, parabens, fragrance and colourants. Providing extremely water and perspiration-resistant coverage in a light, breathable formula that won’t let you down, Techniblock is particularly suitable for sensitive skin prone to prickly heat due to the absence of pore-blocking ingredients such as lanolin. There’s also a Kids 50+ so if you have children in tow, you can relax and enjoy your holiday whilst your little ones are enjoying theirs, safe in the knowledge that they are protected both in and out the water. Many long-haul hot spots are also a magnet for midges and mosquitoes but don’t let irritating bites spoil it. Ward them off with Peaceful Sleep Insect Repellent, the best product on the market for preventing painful bites. Available in both stick and spray format and in a handy travel-size if you’re going hand luggage only, the range is trusted by South African rangers on safari as a clean but effectively deterrent against insects. For added protection, try one of our naturally-infused citronella wristbands, a pack of 10 are just £10 and each band lasts for up to 200 hours. When it comes to the sun, we’ve got your covered. Shop now! Following popular demand from our customers, we are pleased to confirm that we are now stocking a wider range of Peaceful Sleep products. and is now available via the Techniblock website for delivery within the UK and some European countries (see website for details). Trusted by safari rangers, who spend all day, every day in the bush, this clean, clear repellent is proven to deter midges, mosquitoes, flies, ticks and fleas. Available in a light, but highly effective, aerosol spray that goes on easily and doesn’t leave a sticky residue, which is great for sensitive and irritated skin, as well as in stick format to target specific areas such as the ears, wrists, ankles and neck. Containing 15% DEET as well as natural plant-based oils such as lemongrass and citronella, it’s not unpleasant to use and one application will protect against irritating and painful bites for up to 8 hours. The spray is also available in a handy, 85ml can making it ideal for hand-luggage travel only. Check out our Weekend Travel packs, containing a 75ml sunscreen for the face and body, a lip balm and an 85ml can of Peaceful Sleep. We have also introduced a new, kid-friendly Family Care repellent in stick format, which is suitable for babies from 6 months and children up to 12 years. The Peaceful Sleep Family Care repellent stick is DEET-free, but equally as effective at keeping the bugs at bay. Combine this with one of our citronella-infused Anti-Mosquito bands and your child will be bite-free and happy. And last, but not least, if you are looking for a sunscreen and a natural insect-repellent in one, then try Techniblock’s SPF 40 spray infused with citronella. It comes in the handy, 75ml size that so many of our customers love so it’s perfect for a weekend away or popping in a pocket or handbag for protection on the go from sunburn and bites. , whether you are on the water kayaking, sailing, paddle boarding or windsurfing, or in the water enjoying diving, snorkeling or swimming. The main base for many of the more traditional sun lotions and creams available today are oils and emulsifiers; these ingredients are used to encapsulate the UV filters which, when applied to the skin, tend to leave behind a greasy residue, especially with a high factor protection. The higher the SPF, the more UV filters in the formula, and this often makes them sticky and uncomfortable to apply and wear. Also, oils and emulsifiers break down in water and, therefore, the lotion must be re-applied frequently, particularly after swimming.
. Even while swimming, Techniblock keeps on working to protect so you can enjoy the water for longer, safe in the knowledge that the powerful, modern formula will keep you sunburn-free. and our SPF 50+ sunscreen offers very high protection for 8+ hours, even in the harshest of environments. It won’t run in to eyes and sting and sand won’t stick to it. The spray formula works at any angle, which allows for easy application and protection is instant. 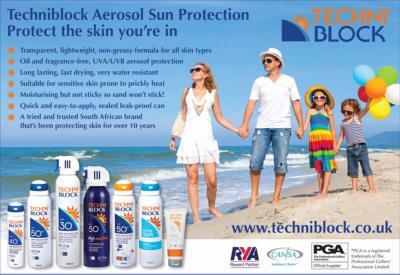 Techniblock has teamed up with RS Sailing in support of the upcoming RS Games due to be held in Weymouth in August and there will be an opportunity for competitors and visitors to sample the Techniblock suncare range throughout the Games. Visit the pop-up shop in the Sailor’s Hub and enjoy discounted prices or order online at www.techniblock.co.uk and enjoy 10% off your first order with the discount code RSGAMES. 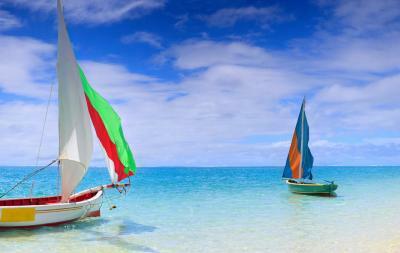 Techniblock is also an RYA Reward Partner and RYA members benefit from an exclusive discount too. Visit the Members Benefit page for details. Summer is well and truly here and it's set to stay, at least for the next couple of weeks! Everyone knows how important sunscreen is when the temperature starts to rise but, equally, many people hate using sun protection. If thick, greasy and difficult to rub in sun creams are making you hot, sticky and uncomfortable, try something completely different. Techniblock Aerosol Sunscreen is a lightweight but powerful sun protection that’s resistant to water and perspiration, providing an almost transparent but extremely effective barrier against harmful UV rays. Forget itchy, irritated and sunburnt skin, Techniblock’s high quality, UVA/UVB formula allows skin to breathe freely and doesn’t contain any oils, emulsifiers, colourants or perfume. This makes is perfect for sun-sensitive skin that’s prone to prickly heat rash and, according to our customers, is the best solution to prevent symptoms so you can enjoy the sun. Ultra-dry, instantly absorbed and super-quick to apply, this spray sunscreen works at any angle so it’s easy to "do it yourself” on hard-to-reach parts of the body. Non-sticky and very resistant to water and perspiration, it’s great for keeping you cool during the hottest part of the day. Recommended by the Royal Yachting Association, Techniblock's SPF Wet & Dry spray is brilliant for enjoying water sports such as sailing, yachting, snorkeling, windsurfing and canoeing. It's a firm favourite with the GB ParaCanoe team and it's also great for children who like to sit and splash in the pool because you can top up without drying off. A range of sizes are available in SPF 30, SPF 40 and SPF 50+ High Protection, including a handy 75ml spray that's ideal for hand-luggage only travel or for popping in your bag for instant protection on the go. Our High Protection Children's range will keep kids safe in the sun, and one application will last them for the duration of the school day so they can enjoy play times without worrying about sunburn. Check out our independent customer reviews on Shopping Satisfaction and Trusted Shops to help you choose the right sun protection for you and your family.